About a month ago, an unbanded male adult was rescued from a balcony in the south loop. I didn’t get to see him before he was taken out to George for rehab, but I thought it was likely it was our south loop adult male. He’d really injured his leg during nesting season and I wondered if the leg was the reason he went down. 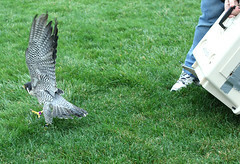 George called us last week to say that the bird was healthy and ready for release. I accompanied Mary out to the suburbs to rendezvous with George. We met in our usual spot, the large parking lot of a truck stop/gas station way out west. 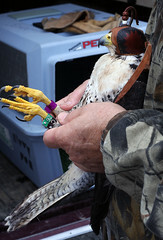 We decided to band the bird (b/g C/26) while we were transferring him from George’s carrier to Mary’s, so I got a really good look at the leg, which appeared completely normal. So, either this wasn’t our south loop male OR the leg had healed wonderfully. On the drive back into Chicago, Mary and I kept pretty quiet, as our falcon friend seemed super-eager to get out of the carrier and was banging into it. We thought it was best to keep the atmosphere calm and quiet. Mary planned to let the guy go on the north lawn of the Field Museum. That way, if he was the south loop male, he’d be very near his territory. If he wasn’t, he’d at least be close to where he was picked up. A few people met us in the museum parking lot, including longtime FMNH employee Peter Lowther, who was to be this birds namesake. The day was overcast and windy, but not too cold. We all trundled back to the north lawn and I scoped around with binocs to see if I could see one of the south loop birds. I spotted one sitting on the corner of the Hilton. Mary set the carrier down, everyone got back and she opened the door. Considering all the noise he was making in the car, we both sort of expected he’d come shooting out, but of course he did not. Mary tipped the carrier up a bit, but still nothing. In the end, she had to just about tip the carrier vertical to get Peter to come out of his hidey-hole. Out he came. He took one quick look around at all of us, took a couple of run-hops onto the lawn and then rose up into the air. Free at last! He flew to the north and I watched the peregrine on the Hilton take off and come our way. Either this was going to be a reunion, or one of the south loop birds was going to make sure this bird went on its way and didn’t dilly-dally in their territory. Peter decided to head south, away from the south loop territory, and the other adult flew over us a few seconds later, in lazy pursuit. Since it wasn’t nesting season, we didn’t expect the south loop birds would be super-hostile towards an outsider (just in case that’s what Peter is). Both birds flew out of site, so we didn’t see them interact, but a few moments later an adult came back from the south, looking not too excitable, so I’m betting nothing too big happened. We’ll have to wait until nesting season rolls around to see if Peter was, indeed, our south loop male. But, for now, Good Luck, Peter! ~ by Steph on October 22, 2009.